How can I set up my store to use Royal Mail and ParcelForce shipping methods? For our merchants who's business presence is in the UK, 3dcart is compatible with real-time shipping calculation provided through both Royal Mail and ParcelForce. This article will detail how to set up your store for Royal Mail and ParcelForce shipping calculations as well as special considerations that need to be made when using these particular carriers. For rolled and cylinder shaped items, the length of the item plus twice the diameter must not exceed 104cm, with the greatest dimension being no more than 90cm. Rolled and cylinder shaped parcels that measure up to 45cm in length and 8cm in diameter and do not exceed 2kg can be sent as small parcels. More information on these restrictions can be found here for Royal Mail and here for ParcelForce. 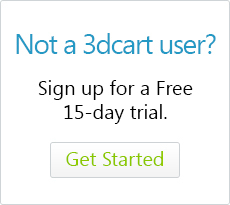 As mentioned in a previous article, 3dcart's software uses neither metric or standard measurement units. Instead, the numbers listed in your product weights and dimensions are simply numbers. Ultimately, it is up to the real-time shipping carrier to determine what the denomination will be for the order (i.e. U.S. based carriers will calculate "2" as 2lbs whereas European carriers may calculate "2" as 2kg). This is something you'll want to keep in mind when setting up your store for these UK shipping carriers. If an item you're selling is weighed in grams, you will need to specify its weight as the kilogram equivalent. In other words, something that weighs 500 grams will need to be configured in your store as weighing 0.5, since kg is the base increment used for these two carriers. Product dimension measurments will need to be specified in mm increments. As an example, the following image will illustrate the proper set up of a product with the appropriate weights and measurements set in the 3dcart Online Store Manager. Weight for the order will be the total combined weight of all items on the order. This setting will control how many boxes are used for the order when the total weight of the order exceeds the amount entered in the field. In other words, if the order's weight is within this amount; shipping will be calculated as one box. However, if the order's weight goes over the number entered here, shipping will be calculated for a second or third box as needed. Now, even though the field says "(Lbs)" it still follows the same "neither standard nor metric" rule for 3dcart measurements. So your Max Box Weight should reflect kilograms if you are using Royal Mail/ParcelForce. For example, due to the fact that ParcelForce's limit is 30kg per box, you would enter a 30. However, your specific needs may require smaller increments as needed. Further note that you would use the same weight logic if you are using the pre-defined boxes option. The data entered in this area will serve as your real time shipping calculation's point of origin for the returned rates. More information on setting up your store's country information can be found here and here. Also, if you are using drop shippers, please review the Drop Shipper article, located here. Click "+Add Methods " under RoyalMail. When ready, click "+Add" to proceed. The methods will be added all at once. Repeat the same steps for ParcelForce if you will be using that service as well. After the shipping methods are added, you will have additional configuration options available to each one separately. Here, you can add a pricing markup to the shipping method if you'd like to add a certain amount to each calculated rate. Markups can be entered as a flat monetary amount or a percentage markup. The Customer Pricing Group that this method will apply to. For example, if you'd like it to apply to all of your customers, you would select "All." Clicking on the "Exclude List" link will allow you to specify states and locations (In the already configured country/state designations for the Shipping Method) that you would like to exclude from using the shipping method. For example, if your shipping method applies to all US States, but you'd like to exclude Alaska and/or Hawaii. IMPORTANT: Remember to set the "Max. Weight:" limit to kilogram measurements! For more complete information on setting up your shipping methods, please see our tutorial located here. Congratulations! Your store is now set up to use Royal Mail and ParcelForce Real Time Shipping Calculations.